North Dakota police armed with military vehicles, helicopters, assault rifles and riot gear raided a Lakota-Sioux prayer gathering at the protest site of the Dakota Access pipeline Wednesday. No shots were fired but there were reports of an aerial spray and teargas. Up to 21 participants were arrested, one news report stated. Police and private security officers have been attempting to force the protesting tribal members off the construction site on the Standing Rock reservation. 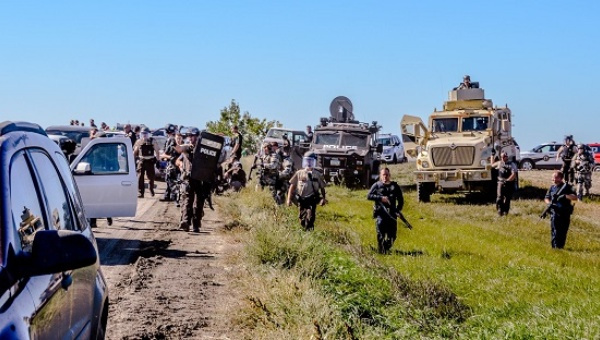 North Dakota Governor Jack Dalrymple last week declared a state of emergency and activated the national guard after tribal members successfully stopped construction of a 1,100-mile-long pipeline which is planned to cross indigenous lands. A serious confrontation between armored police units and the natives was averted when the U.S. Justice Department issued a temporary stop on the pipeline construction on tribal lands. Authorities are investigating a complaint that a private security firm unleashed dogs during what was supposed to have been a “non-violent” direct action. Six people were reportedly bitten by the dogs, including a pregnant woman and a child, one report stated. The Lakota-Sioux have been joined by tribal representatives and environmental activists from all over the United States since the protest began. The natives are opposing the pipeline because it will be not only crossing reservation lands but passing through Lake Oahe and the Missouri River. Tribal officials warn that a pipeline leak would destroy the tribe’s access to clean drinking water. This pipeline will be capable of carrying up to 578,000 barrels of crude oil a day from shale deposits. Similar pipelines have been springing leaks all over the country. While President Barack Obama has spoken out in support of the protest, the White House has not issued any other statement concerning the $3.8 million pipeline project. At issue is whether the U.S. Army Corps of Engineers had the legal power to approve the construction project through tribal lands, in violation of tribal sovereignty.